Very interesting! I like your writing style, it reminds me of the way that old authors used to write. The story flows as though you're a 19th century scholar who is trying desperately to save this small portion of themselves. I hope the continued stories are successful! Oh thank you! I suppose I do favor a somewhat old-fashioned style, and it's good to hear that, whatever drawbacks of that there may be, at least I wear it well. As to the success of those stories which arise from the game - I don't suppose that is wholly mine to judge. But one of those stories has taken on - something of a life of its own, I think is not too much to say; certainly, at thirty-seven thousand words thus far and still a couple of scenes shy of done, it has outgrown the scope of a Discord channel. 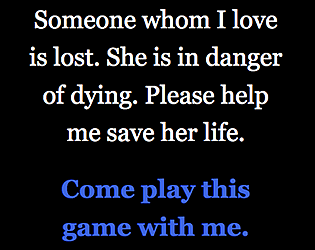 So if you're curious, you can find it in Twine form, here on Itch - and if you do take the time, I'd be delighted to know your thoughts on the tale. This is an unusual comment, but it's a reply to an unusual story, so I think it's appropriate. Have you played The Beginner's Guide? It's a very good game. But there is something troubling about it, the details of which I will not spoil for you here. Players were left with at least a little reason to doubt that what they had witnessed was entirely fictional. And if it's not fictional, that changes what we should think of the game, and its creator. The game never fully clarifies this ambiguity, perhaps out of some sense of artistic verisimilitude, but it raises questions of player consent -- if it's permissible for the creator to cause the player distress over whether what they're seeing is real. I do not feel as though I consented to what I was drawn into here. I have, in the course of my life, tried to talk down more than one person from attempting suicide, and witnessed many others whom I wasn't sure how close they were. It's for this reason that I took the conceit of your story very seriously until I was reasonably sure it was a fiction, and that took quite a lot longer than I would've liked. Some kind of warning at the start probably would have sufficed. You may feel that this breaks the fiction you've tried to create, but I hope that you will consider your responsibility to your players. You seem like a serious writer, and this is as serious a concern as any within the fiction itself. That said...I thought it was very well-written. Kicking off what appears to be an ARG for a game jam is a bold choice, and I have to admit, I'm pretty curious about it. A serious concern indeed! I greatly appreciate your taking the time to bring it to my attention, and can only apologize for my error in failing to consider the need ahead of time - it is no purpose of mine to cause anyone distress by my actions here, and I've added content advice prior to the beginning of the story. As far as "kicking off what appears to be an ARG" goes - I hadn't considered it in precisely such terms, but I suppose that is more or less what I was doing, isn't it? Though I feel I've done rather a poor job of it, and would have done many things differently had I thought it through more ahead of time, rather than acting out of a sense of desperation complicated by the effects of a prolonged high fever. I think the "alternate reality" in this case must thus have existed entirely within the confines of my own skull! Next time, if there is a next time, I'll try to do a better job of making the game's alternate reality more accessible to people other than we who live inside this particular head, and also of making it possible for those who take an interest to know going in whether the subject matter is anything with which they choose to treat, rather than risk putting someone in a place where they do not choose or care to be. Perhaps that latter necessity will, as you say, make it more difficult to maintain narrative verisimilitude - if so, so be it; I'm not sure I am exactly a "serious writer", but if I'm going to engage in fiction of this sort, then I'm going to do so in a way which does not risk harm to its audience. No doubt this will be a challenge! It is one which I will develop sufficient skill to overcome - and in the meantime, I'll from now on use proper care, to err on the side of excess caution rather than that of excess risk. Thank you once again for your kindness in bringing this error to my attention! I would not be able otherwise to repair it, or to ensure I don't err the same way again in future. I do think you've written something moving and powerful here, and you should take pride in that. Also of note: I had two purposes in submitting this introduction here, and otherwise making this a thing. One was for ourselves, and as the introduction describes it: to save a life. That purpose has been served. The other was for anyone else who might choose to involve themselves, and also as the introduction describes it: to make stories capable of having worth for people outside ourselves. Whether that purpose has been served, I am totally unable to say! But there is a story, and I am not without cause for confidence that in it there is aught of worth to be found. So if you're here, I think it's worth your while to go there, and give it a quick read! (Well, I say "quick" - just shy of seventeen thousand words as of this writing, and not done yet.) I'm having a lot of fun writing it, and I'm told by at least some of those who have read it that they've also been having fun doing that. Maybe you will, too!